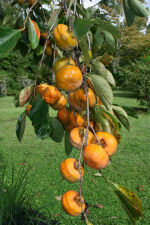 The Rose-Lovell House had such a full crop of persimmons this year that the tree was “self pruning”. Yep, branches were breaking under the load. These are Tamopan (or Japanese) persimmons. They are of the astringent variety which means if you eat them before they are ripe then your mouth would be squeezed in to a pucker for a week! But ripe they are the sweetest thing you’ve ever tasted. Trouble is that they only stay that way for about 10 minutes. When they get extremely soft you overturn the fruit, peel from the bottom and scoop it with a spoon. The edible thick skin will act as a bowl to hold the soft sweet fruit inside.